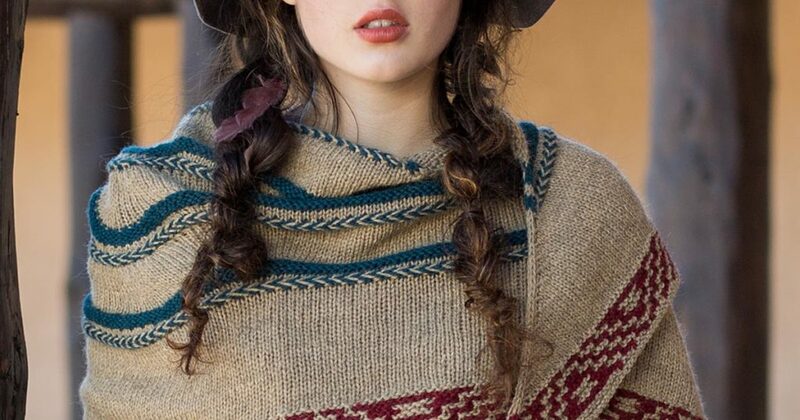 People might wonder about a wool shawl in summer. 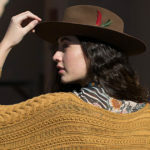 If you live in the high desert, northern plains, or mountainous regions of the U.S., however, you know that evenings can be chilly enough to warrant a wooly wrap. (And no matter where you live, air conditioning can be downright frigid any time of day.) 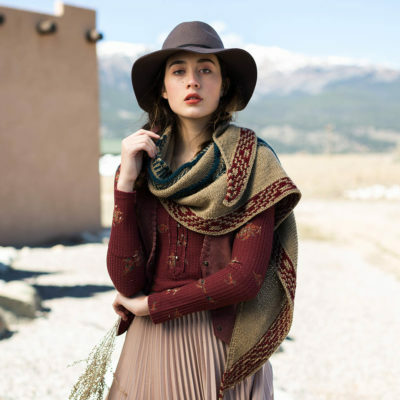 The Whitehorn Shawl, found in Interweave Knits Summer 2018, will become your chilly summer nights go-to. This is the type of shawl I love to take on vacation. The finished piece is light to pack and easy to whip out when you get cold on a train or plane. As a project, it’s a perfect traveling companion as well. Alternating bands of stockinette and reverse stockinette are the sort of mindless knitting perfect for car trips or when you’re hanging out with friends, while the easy slip-stitch colorwork makes you feel clever. Forget what I just said about this project being a “mindless” knit, though. If you’re going to do a Latvian braid, you need to pay attention until you have the rhythm. That said, knitting it is a wholly satisfying experience and just one more reason to cast on. FINISHED SIZE 73″ wide and 20½” long at center. 10% mohair; 238 yd [218 m]/3½ oz [100 g]): #95 St. Bees Beach (cream; MC), 2 skeins; #11 Eden Valley (teal; CC1) and #44 Appleby Castle (red; CC2), 1 skein each. NEEDLES Size 8 (5 mm): 32″ circular (cir). Adjust needle size if necessary to obtain the correct gauge. NOTIONS Markers (m); waste yarn for provisional CO; tapestry needle. GAUGE 17 sts and 28 rows = 4″ in St st. Expand your stitch education with Interweave Knits Summer 2018.